When you think about it, the enterprise workstation market really only has three key players. You have HP, who produce some excellent mobile workstations but have been stagnating horribly on the desktop side. You have Dell, who produce what are in my opinion the best desktop workstations but seem to be substantially less exciting on the notebook end. And you have Lenovo, who excels in neither discipline but offers a fairly balanced portfolio in exchange. This presents a problem, and it's a problem we're looking at today. What we really want and need is a single vendor to order notebooks and desktops from and be able to call it a day. While HP's desktops aren't bad, they're overpriced compared to Dell's offerings. 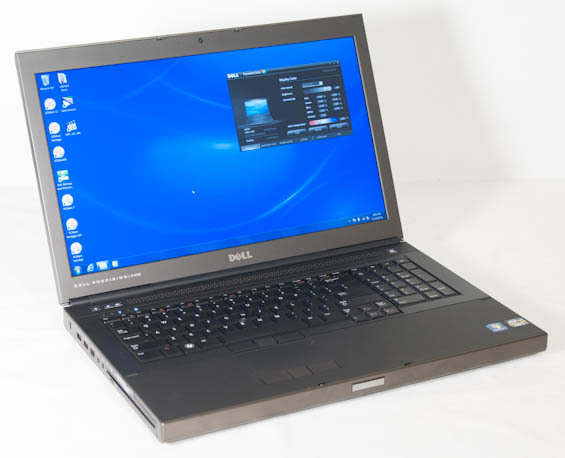 Today we have the updated Dell Precision M6700 on hand, a robust notebook featuring a full sRGB IPS panel with user-configurable gamma, a Kepler-based workstation GPU, and Intel's Ivy Bridge quad core processor. But with workstations it's not just about the internals, it's about the design and the experience. Did Dell come up with a worthy competitor to HP's EliteBooks, or did they just come up short? Three years ago, this wasn't the way things were. HP had great desktops and Dell had great notebooks, but the situation seems to have almost completely flipped. The design language on HP's enterprise class notebooks suddenly unified, offering a combination of style, serviceability, usability, and performance that was able to compete with Dell's Precision line as well as Lenovo's sadly declining ThinkPads. As you'll see, though, just as HP's desktop workstation department seems to be coasting, Dell's mobile workstation department is having a hard time playing catch-up. Dimensions 16.41" x 10.65" x 1.3-1.42"
On the hardware side, the Dell Precision M6700 certainly has a lot going for it. While Dell's BIOS doesn't allow for any overclocking, the Intel Core i7-3920XM is still an incredibly fast processor, with a nominal clock speed of 2.9GHz, able to turbo up to 3.6GHz on all four cores, 3.7GHz on two cores, or 3.8GHz on one core. These turbo speeds put it within striking distance of desktop Ivy Bridge CPUs. The NVIDIA Quadro K5000M is an interesting story in and of itself. While last generation's mobile workstation GPUs continued to be served by die harvesting GF100, the K5000M inherits all the strengths and disadvantages of GK104. Single precision performance should be top flight, but GK104 is more of a gaming chip than a compute chip (similar to GF104/GF114), and so its double precision performance is liable to be below last generation's Quadro 5010M, and we'll see when we get to the workstation benchmarks. For this reason, the 5010M continues to be available. The K5000M is clocked slower than the current top of the line mobile gaming GPU, the GTX 680M, running at just 601MHz on the CUDA cores and 3GHz effective on the GDDR5, with no boost clock. Internally, Dell also offers an mSATA port at SATA 6Gbps speed as well as two 2.5" drive bays and the ability to remove the optical drive and replace it with a third 2.5" bay, allowing for potentially four storage devices. Also included are a SIM card slot and space for a WWAN card. Externally you have a card reader, USB 2.0 and 3.0, ExpressCard/54, 6-pin FireWire, eSATA, and every modern display connector except DVI. Yeah, but how many fps do you get playing Quake? Look at the SPECviewperf results. Consumer GPUs are still woefully inadequate for a lot of workstation tasks that Quadros are geared towards. The GPUs in MBPs may be fine for video and image editing, but that's really about it. So basically, the prices are high because a bunch of computer neophytes (most Mac users) are buying 2-5 year old laptops thinking they are 1 year old. My cousin almost bought a new Macbook at his school store on sale for $900. He called me first and I talked him through how to find the model number. It was an ancient Core 2 Duo model when the latest were sporting Sandy Bridge CPUs.